Groundwater Science is a timely, current, and comprehensive presentation of groundwater hydrology that integrates chemistry, physics, geology, and calculus. With the input of students and other hydrology instructors, the author has developed a text reference that will be appreciated by students and professors alike. The book covers recent contamination topics such as non-aqueous-phase liquids (NAPLs), complex solute transport processes, and remediation. It contains clear explanations, two-color figures, case studies, and worked examples throughout. 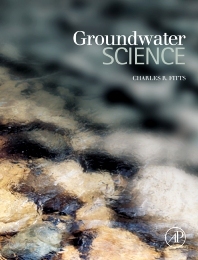 This book is recommended for upper-level undergraduate and graduate students in hydrology, geology, environmental science, and civil engineering departments as well as for scientists and engineers in the groundwater field. Upper-level undergraduate and graduate students in hydrology, geology, environmental science, and civil engineering departments. Scientists and engineers in the groundwater field. Preface Groundwater: The Big Picture. Physical Properties. Principles of Flow. Geology and Groundwater Flow. Deformation, Storage, and General Flow Equations. Modeling Steady Flow with Basic Methods. Modeling Transient Flow with Basic Methods. Computer-Assisted Flow Modeling. Groundwater Chemistry. Groundwater Contamination. A: Units and Conversions. B: Mathematics Primer. C: Book Internet Site. Answers to Selected Problems. References. Index. Periodic Table of the Elements. Charles R. Fitts is a professor at the University of Southern Maine with research interests in hydrogeology, contaminant migration, and applied mathematics. He earned an MS in engineering geology at Cornell and a PhD in civil engineering at the University of Minnesota. He has consulted for various geotechnical and groundwater companies, and is author of several groundwater modeling software packages: AnAqSim (analytic aquifer simulator) and TWODAN for groundwater flow, and SOLUTRANS for solute transport. University of Southern Maine, Gorham, U.S.A.